Recently I visited New Orleans for the first time (and surely not the last). New Orleans is a foodie mecca, and most visitors probably go for the crawfish etouffee, the fried oyster po’boys, the shrimp-laden gumbo. Me? I went straight for the macaroni and cheese. And the macaroni and cheese went straight, itself. Turns out the regional version of “baked macaroni” features spaghetti instead of a curly or hollow noodle. Hmm. That seemed counterintuitive to me, but naturally I had to give it a try. An extensive Google search yielded recommendations ranging from legendary high-buck Garden District eateries to humble soul food kitchens far outside the city limits. Only one mac source was within my limited travel range. 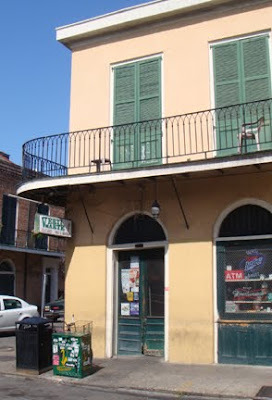 Verti Marte is a small and odd place located on Royal Street, smack-dab in the middle of the French Quarter. One step into the store and you’ll learn that it’s dingy and cramped, the selection of prepackaged foodstuffs is comically random and the checkout guy is 100% personality-free. Most noteworthy, there are EIGHT security cameras taking note of your every move in this teeny tiny space. But forge on past all that, because Verti Marte’s charm lies in the refrigerated deli cases at the back of the store. Wow! That there is, in fact, a lot of jazz. Their slogan is “Real Food for Real People at Real Prices,” and at under $10 for a generous main and two heaping helpings of sides, it appears they live up to it. Despite the extensive menu, I had eyes for only one dish. 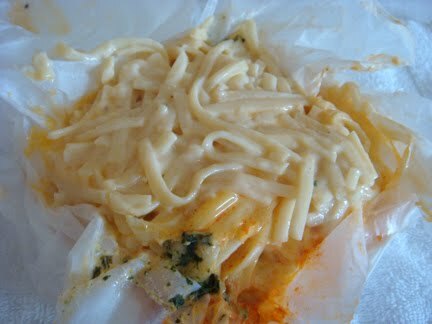 A friendly counter man cut a big cube of cheesy noodles from the pan, heated it, wedged it into a Styrofoam box, swaddled the box inside a thick veil of plastic wrap and handed the weighty parcel to me with a twinkling smile. “You’re going to love it, bebe,” he assured me with a saucy wink. Swoon! 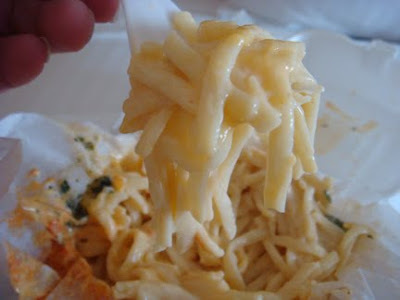 This pound or more of cheesy noodles rang up at a modest $2.49 – blessed relief for my vacation pocketbook. There’s no room to eat inside Verti Marte – there’s no room to breathe inside Verti Marte -- and I couldn’t even find a park bench so I ended up carrying the mac ten blocks, all the way back to my hotel. 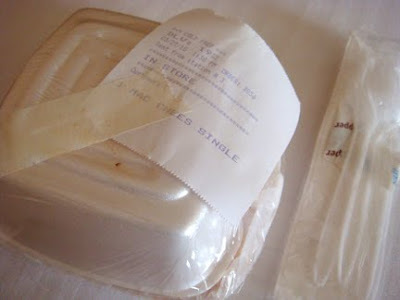 Of course, the food was ruinously cold by then. But I dove in anyway, ever the intrepid reporter. That’s right, bebe – I do it all for you. Verti Marte’s baked macaroni consists of nicely cooked linguini, a mild cheese sauce spiked with paprika and a sprinkling of fresh parsley. It was pleasant but not as special as I had hoped. The flavor was one-note, I’m guessing American cheese because of the smooth sauce consistency. Maybe a little Cheddar. Most disappointing, it was almost impossible to wrangle the long, tangled noodles from the dense block with only a flimsy plastic fork. This mac definitely would have scored higher marks in its intended hot condition. I’m glad I checked it out because Verti Marte is one of those Local Color kind of places that really fleshes out a vacation, but I don’t think I’ll order the mac next time. There was too much other good-looking stuff in that deli case. PS: Shortly before I arrived in New Orleans, my friend Katherine had a chance to sample the mac and cheese at Café Reconcile, a Central City lunch spot dedicated to training young people for careers in the food service industry. She says I really missed out on some good grub! Her review of their mac is in the works.